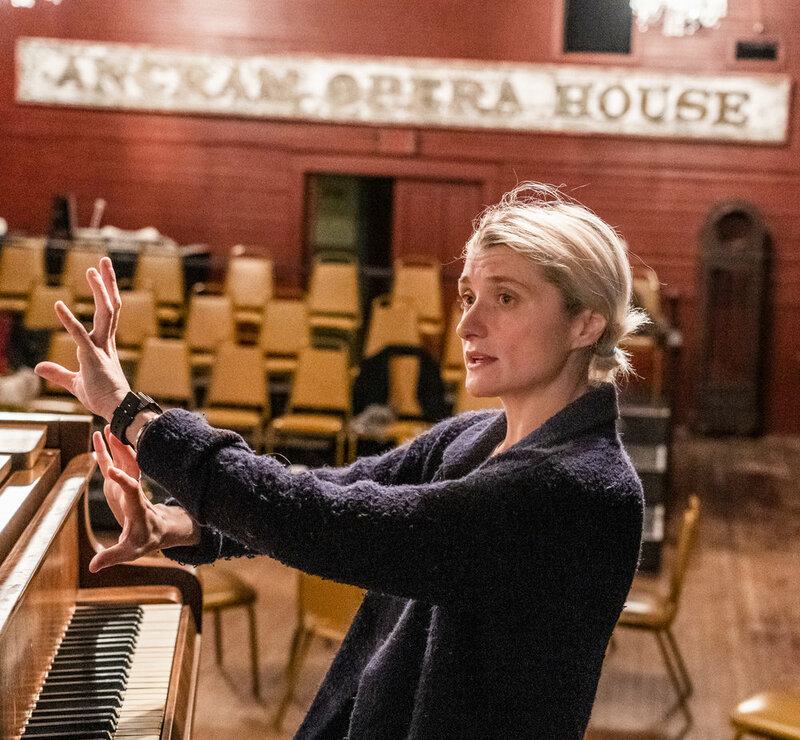 DRIVE-IN: AMERICAN FUGUE is a FREE community event, led by Obie Winner composer and performer HEATHER CHRISTIAN. Heather will work with residents of the region to write a cycle of songs about what it is to be right here, right now in our community. The songs they create will be performed for the public. Reception to follow! Recently named one of TimeOut NY’s “Downtown Innovators To Watch,” Heather Christian has scored for the stage, movies, and dance as well as for her band Heather Christian & the Arbornauts. We talked with Heather, the daughter of a blues musician and a go-go dancer, about how she creates her art. AOH: Tell me about this songwriting project. What do you want to accomplish? HC: I come from a very small town in Mississippi, where I had limited access to the arts growing up. I went to college in New York and once I had access to arts education – especially songwriting – it loosened my tongue artistically, gave me bravery and confidence with how I use words in my everyday life, and helped me to engage in conversations with people I disagree with or with whom I have very little in common. Today when I go home to Mississippi, I see such a divide between people, something that remains largely undiscussed, I think, out of courtesy. It breaks my heart. I can’t help but think there’s a correlation between facility with language and civil, productive conversation. There’s no funding for the arts in rural communities, so I had this idea about starting conversations in rural towns and villages through songwriting. Music beatifies perspective and is abstract enough to coax out an idea that doesn’t, otherwise, want to come out of someone. I plan to repeat this workshop in 11 other rural communities and then bring all these perspectives together in a devised choral piece that is larger than the sum of its parts. AOH: Why did you decide to do this work in Ancram? HC: Because of Paul (Ricciardi) and Jeff (Mousseau) at the Ancram Opera House. AOH is the first institution so far to look at this giant bonkers idea and say, “Yup, we can help you do that.” AOH had a vested interest in broadening its community outreach, and I had a vested interest in teaching workshops and writing in a rural area that is within driving distance to both a drive-in (I’ve got several to pick from here!) and a cultural hub (NYC). It’s a Goldilocks situation that Paul and Jeff made possible. Period. It’s no small thing to have the courage and faith in an artist to agree to be the petri dish in these initial stages. And now that I know it’s possible, I’m eager to start looking for the subsequent eleven rural towns and keep building. AOH: How did you choose the title DRIVE-IN: AMERICAN FUGUE? HC: There used to be thousands of drive-ins in America, but only 321 remain. Drive-in theaters flourished in the 1950’s and 1960’s. I identify this era as the Pax Romana of the American timeline: shady stuff may have been going on politically, but largely, it seems, this was the time right before Americans started doubting the good will of their institutions. Regardless, it used to be easier for people from all walks of life to gather in a single place and share a collective experience and I wanted to tip my hat to that. The show will eventually be performed at drive-ins. The Fugue (the large musical work comprising all the lyrics and music from all 12 communities in conversation with each other) will be the live soundtrack to a “movie” of non-narrative footage from all these places. It’ll be arranged for school marching bands and choirs, so the towns that made it can be the towns that perform it in the end. People can experience the show sitting in their cars, or sitting on the ground on a blanket: alone but together. There are more rural towns with drive-ins than there are rural towns with theaters, so I thought: Let’s build a show that doesn’t need a theater, that will pull the urban art-loving audience to the outskirts for once, instead of the other way around. AOH: What kind of songs are the workshop participants coming up with? HC: Some people have spent their lives Ancram, some have retired here, others are living here just for now, so people are experiencing the community in different ways. I have a series of exercises and improvisations built towards pointing each individual to talk about what’s important to them. For example, I asked everyone to write a kitschy billboard slogan for Columbia County, which turned up some real gems. Some of my favorites are Hey you in the Jimmy Choos, watch out for the cow pie and Columbia County— We Got ’Em: Speed Traps. These slogans became the chorus of pop songs we wrote about “things we were worried about” for the community. In music, context tells you how to decipher the code. Everything can become metaphor, everything can have a double meaning. Describing the Roe Jan region can be a way to talk about mortality, musicalizing a dissertation on poison ivy can explain a love affair. The beauty of music is that the message is in the eye of the beholder. AOH: Are the participants professional musicians? HC: A few people have experience making music, but others have never tried to write a song or even sung in public before. To be honest, I’m not as interested in teaching professional musicians as I am teaching hobbyists and curious dabblers. There’s more surprise and delight that happens in a room of non-professionals. There’s less of a fixation on what a song should be; it’s a much more fertile ground for innovation. One of my biggest tenets as a maker is that EVERYONE has the ability to write a song, and EVERYONE has the ability to sing. You just have to get people out of their own way. Mostly what that looks like is me running participants through exercises that keep changing the objective, to get people to stop thinking so much and just start putting words, any words, onto the page or into their voices. The melodies get weird, the lyrics get inspired— it’s delightful. Last week each of the 11 workshop participants finished five songs apiece. This week I’m taking those 55 individual songs and arranging them into five pieces of choral music where I’m trying to synthesize the community perspective through music. 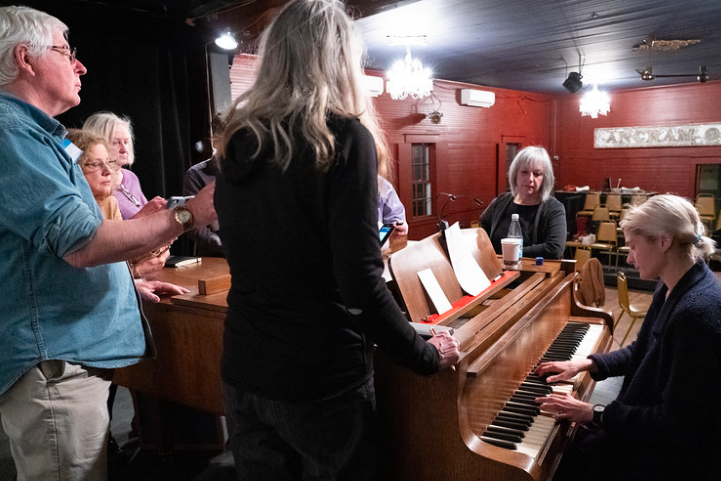 Once that’s done, I’m teaching those five pieces to a larger group of volunteer singers from the community and everything will culminate in a concert on April 13 at the Ancram Opera House. AOH: Do you think different geographies will come up with different kinds of songs? For example, will a town in the South create different music than a Northeast town like Ancram? HC: I certainly hope so! I am assuming each community has different strengths, and my goal is to augment the workshops accordingly. Here, we had a fair number of playwrights and prose writers in the room, so I tried to focus on improvisation. Writers inherently organize their thoughts coherently, so a lot of the Ancram workshop became about disorganizing, deconstructing and reconstructing content. I can only hope that my rooms will be filled with different kinds of strengths and weaknesses that vary from town to town. In communities where music is centralized around churches, melody will likely come easier, and I imagine I’ll have to beef up the workshop to concentrate on language in a way I didn’t have to do here. In any case, I’m trying to get people to write outside of their default settings. I find when you put people in a group and take away the topic they typically want to write about -- for instance, with my NYU students it’s their boyfriends and girlfriends, here, it’s regret for what people didn’t do with their lives professionally -- all this other stuff starts coming up. The thing that’s hiding just under the thing you THINK you’re concerned about is the real stuff. And I’ve got to be ready, as the person who led them down this road, to hold it. People come here, I assume, because they want to learn something – songwriting – and in the process they are learning other things about themselves. When all that’s on the table you can look around and see how much you have in common with other people in the room. There are intersections and synchronicities between people that you wouldn’t expect. They can be small things, very tender things, but they are there. AOH: What have you learned so far from working with the folks in Ancram? HC: I’ve learned that it’s a lot easier than I thought it would be, and that the whole of my heart is in the process of making it. Before now, I’ve been concocting it with a passion for what it WILL be, but what I found is that I’m passionate about HOW it’s being made. I fall in love with everyone in my workshops as writers, yes, but also as humans. I was surprised also that people here are open -- I didn’t have to forcibly pull things out of them. Songwriting is excavation, whether you set out to do that or not. And everyone here has undertaken it with courage and with grace. I reap the enormous benefit of getting to know them and witness all this digging. If interested in joining the workshop as a singer, please click here.